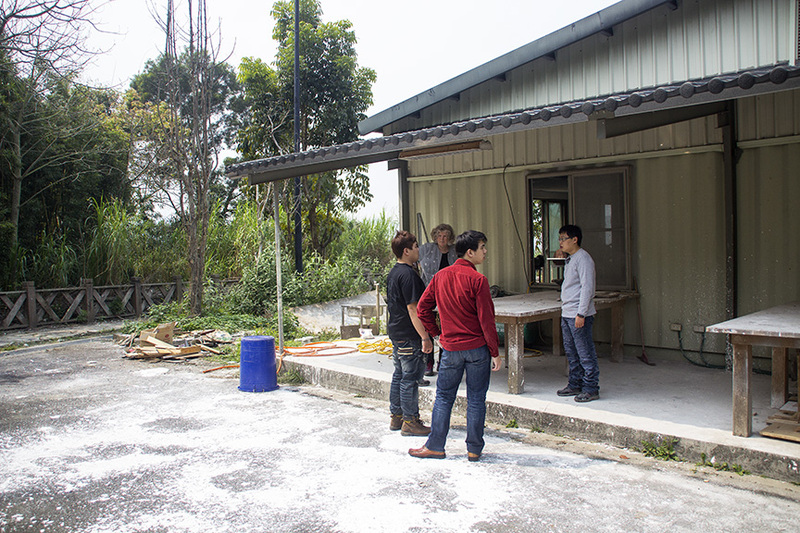 This photo shows me looking over the outdoor studio space on the first day of my residency at Nan Hua University. This is where I will set up a hand papermaking studio and work with the students in Architecture and Landscape Design to make a collaborative multi-part installation of handmade paper using all natural and bio-degradable materials. The idea for this art installation came after visiting the campus and talking about the environmental problems in the area, and we decided to try to make an art installation that would symbolically help to heal the land that had been damaged when the university was first built and a road was cut into the hillside destroying the beautiful curve of a ridge. After studying the site, I thought of using colorful handmade paper prayer flags suspended from the trees on either side of this cut. This is my first sketch of the art installation, showing that the artwork could be made in many unique parts and involve the students to teach them about papermaking and introduce the idea of creating art with natural, biodegradable materials that could be good for the environment and go back to nature after lasting for a while. 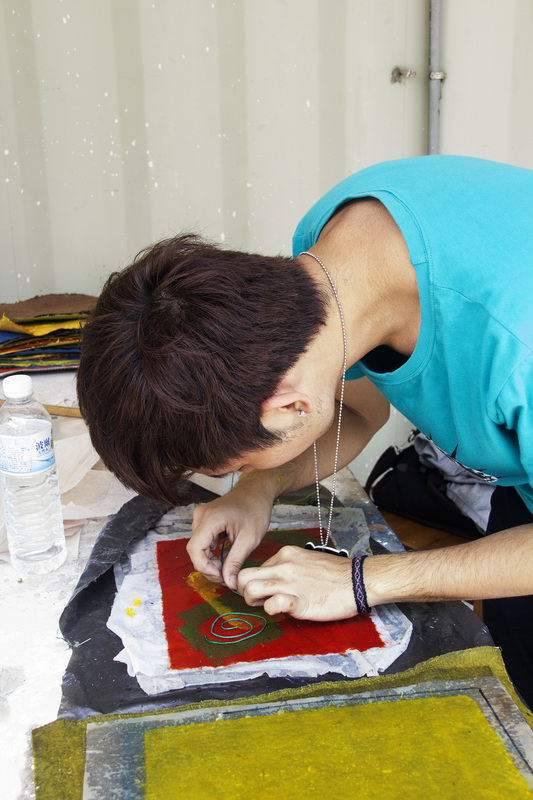 This photo shows a handmade paper prayer flag in red being made by a student at Nan Hua University. 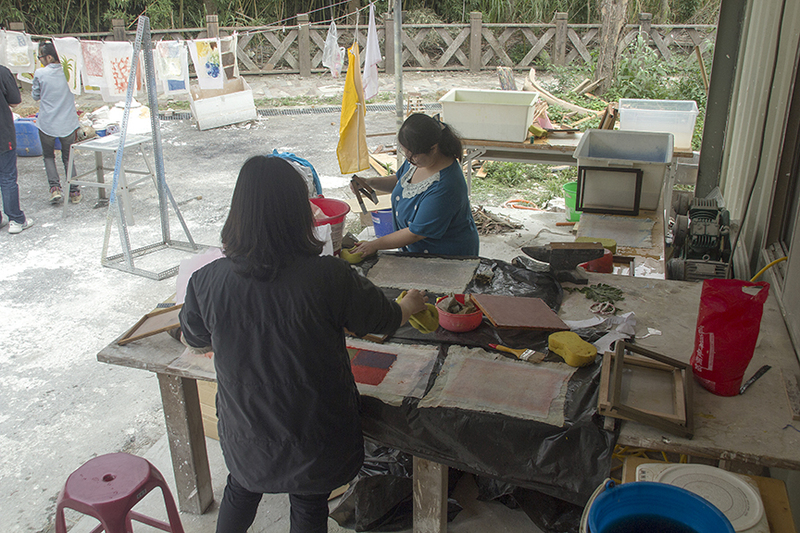 Here you can see several students making handmade paper prayer flags for the installation. 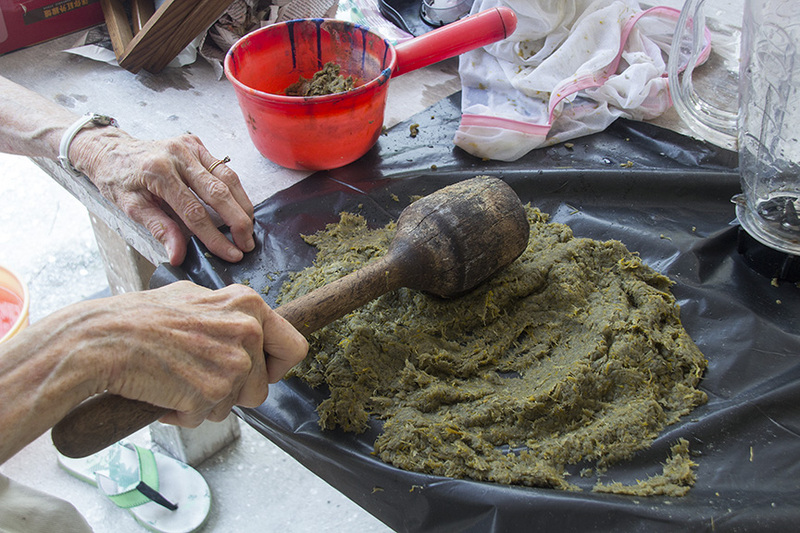 In this photo you can see a student helping to color the paper pulp with yellow non-toxic fiber reactive dye. This photos shows a group of students posing with me in fron of the lines of handmade paper prayers flags they created drying in the sun. We used 4 local plant waste materials to make some of the paper for the prayer flags, and also bought some prepared pulp from the paper factory in Puli (Nantou County) Taiwan to use for the prayer flags. 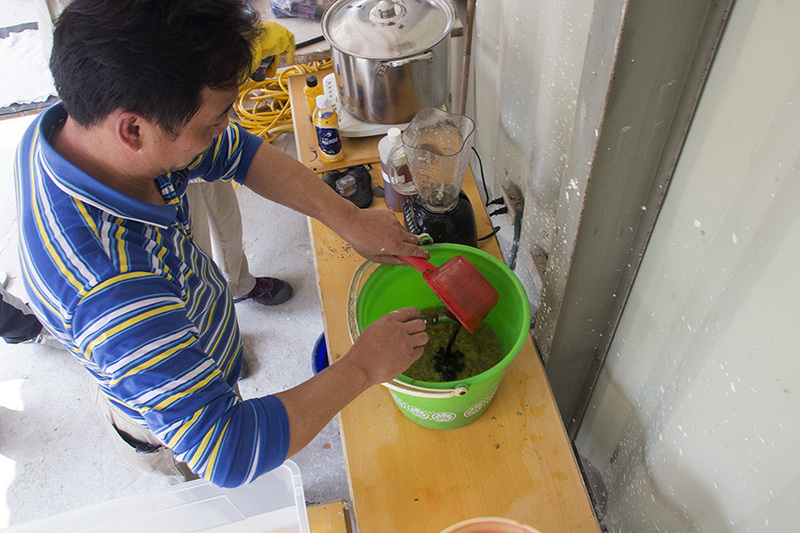 We dyed the paper pulp with liquid fiber reactive dye that is non-toxic and does not harm the earth. This photo shows me beating some local sugar cane plant fibers to make pulp for some of the prayer flags at Nan Hua University. 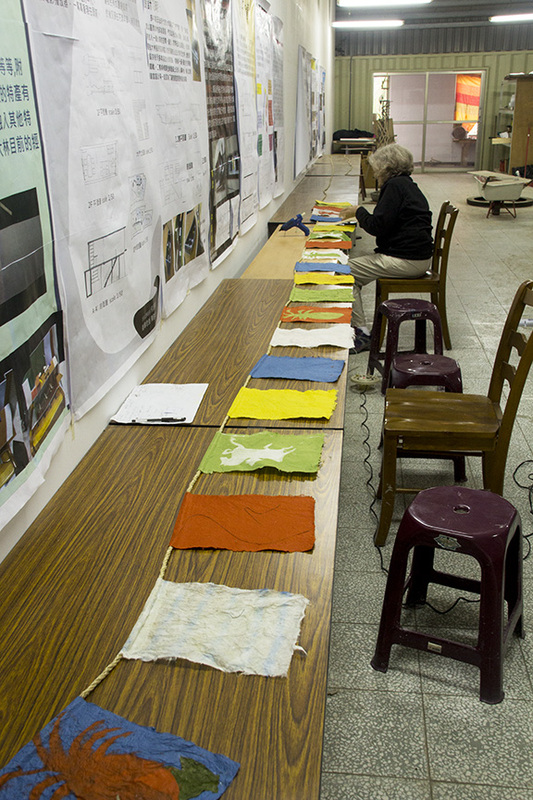 During the two-week residency, we made almost 300 handmade paper prayer flags in the traditional 5 colors. Blue means the sky, white means the clouds, red means fire, green means water and yellow means earth. With these five colors in their proper order, the prayer flags will help bring the world into balance. We put images of the “wind horse” on some of the prayer flags. 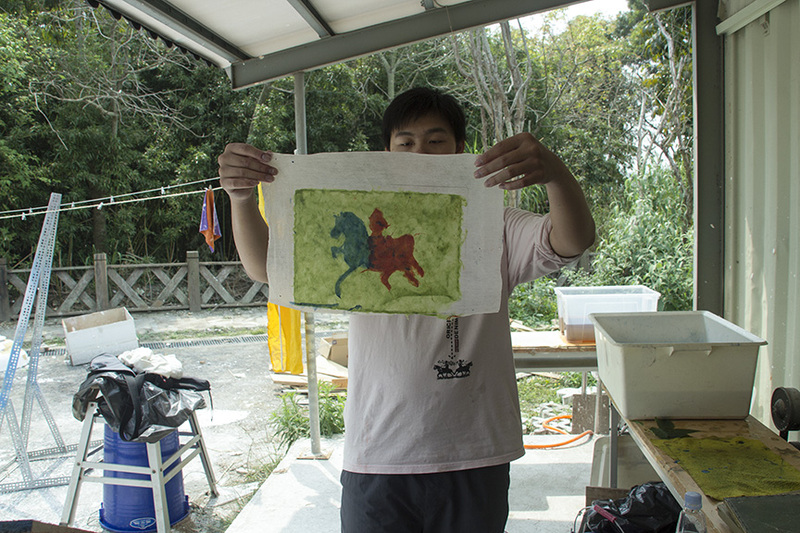 Here a student is holding up the handmade paper with the wind horse image that he just made. This image is often found on Tibetan prayer flags to carry the prayers with speed and strength to all the earth. We also used images of the pineapple on some of the prayer flags because in Chinese culture the pineapple is a symbol for success and prosperity. We put many other good symbols and words in English and Chinese on the prayer flags and did some drawing and painting on the handmade paper prayer flags. The tradition of hanging prayer flags is common in Tibet, and they are usually hung from high mountain passes to bring blessings and good luck to the people and all creatures. I have also seen colorful prayer flags hanging at temples in Nepal, shrines in Japan and in other countries. It is a great tradition and way of sending prayers or wishes in any language or culture. The first part of the project “healing of the earth” was done on Tuesday of the first week I was there, and we consulted with a famous Feng Shui Master in Dalin who told us to connect the two sides of the ridge with threads in the 5 colors and to leave the threads across the road on the ground covered by some earth so that cars could still go across. 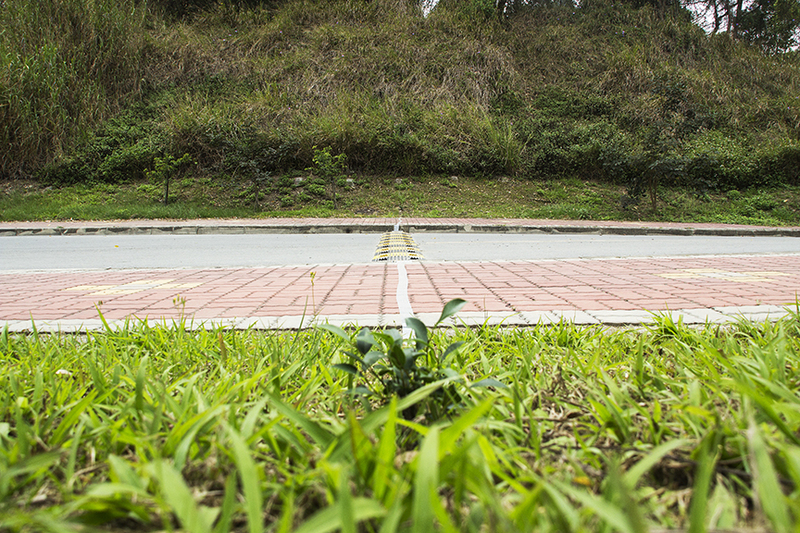 We also planted a young tree (a special Chinese banyan tree) on each side and tied the five colors of thread to the roots of the tree that was planted on each side of the road. This symbolic joining back together of the broken land with the threads will start to heal this earth. The second part of the healing will be my art installation made with the students consisting of 250 colorful prayer flags suspended on natural ropes from tall trees growing on each side of the road. There are 10 ropes each about 30 meters (100+ feet) , 5 on each side, with 25 prayer flags on each rope. We hope this art installation will help to complete the healing and bring good fortune and good luck to all the people and creatures of Nan Hua University. The art installation will stay in place until it biodegrades and can go back to nature without harming the earth because all the materials are natural and biodegradable. Maybe it will last for several weeks or months; nature controls its destiny. I enjoyed very much the opportunity to work at Nan Hua University and create this art installation with the students and hope that it will help to “heal” a small part of earth on this campus and that it will inspire the students to take better care of our environment and to use natural materials and good environmental practices to make their art. Really today the earth in all parts of the world needs healing, and all people should think more about what we do to harm the environment with our art and with our actions. This photo shows the site for the art installation. My next post will feature photos showing the finished installation of 250 handmade paper prayer flags. My husband Tim and I will be going to Taiwan again this Spring for 3 months. We fly from SF to Taipei on March 5 and will return to Santa Rosa on June 2. 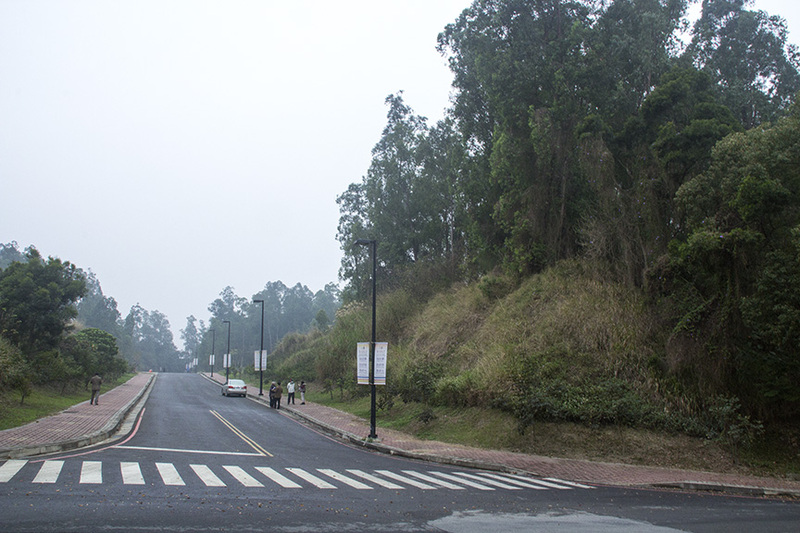 March 16 – 29: Nan Hwa University, Dalin, Chiayi Country, Jane will do an artist-in- residency project with the university students in the Department of Environmental Design, creating an outdoor public art installation on campus with hand papermaking and natural materials. May 11-24- stay at Kun Shan University in Tainan. Jane will be a visiting artist at this university to teach papermaking art for the graduate students and give lectures for the students about environmental art and hand papermaking. Tim will have a photography exhibition at the campus gallery and assist with the teaching to include using photography with handmade paper art. 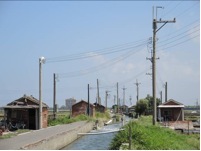 May 25-29 – go to Hwa Yuan village, Hsinchu County. 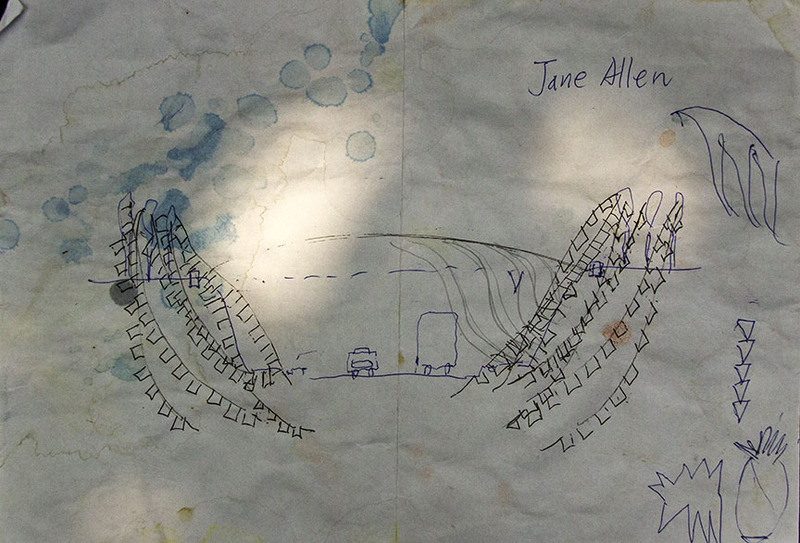 Jane will be an artist in residency at the village and work with the elementary school to create a site-specific handmade paper site map about the Pith Paper plant that is grown in this village. 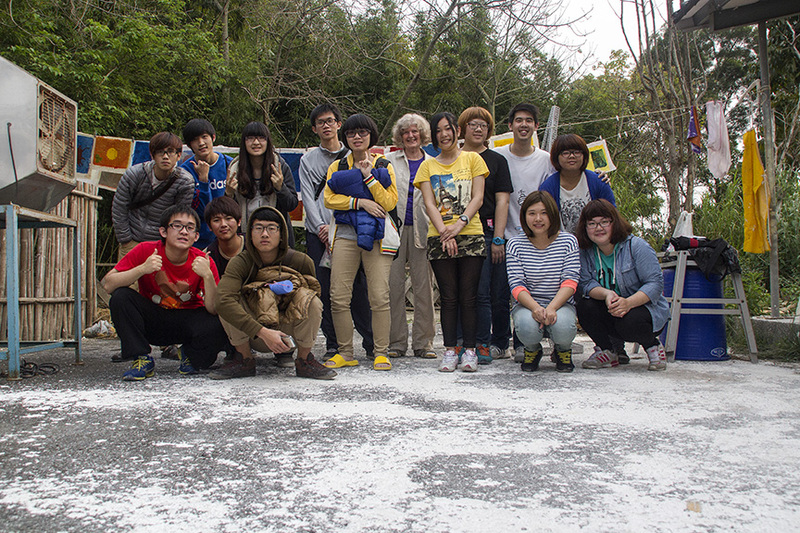 Be sure to check back often so see posts about the residencies and projects in Taiwan during these three months.